Over christmas, my brother and me were bored and were looking for something exciting to do. He has been playing with Arduino for quite a while and I am working with INGA in my day job. Since INGA is based on AVR microcontrollers, I had the vision to make it to work using the Arduino software for quite some time. Furthermore, we have a Tamiya Bear Hawk remote controllable car lying around that we did not use for some years. In fact, it is a quite old RC model but has a powerful Mabuchi RS-540 motor. Furthermore, the car features a mechanical speed controller (MSC) and is quite light weight which makes it almost impossible to drive safely but produces lots of fun. So, it is an ideal starting point for optimizations. I know, that a couple of guys have done similar things. However, I was unable to find a clear statement of what they did and what the problems were including their source code. Therefore, I have typed up our own way of doing it. The biggest problem that we encountered was the absence of a soldering iron. This lead to a bunch of electrical contact problems that we could have avoided by simply soldering. We tried to avoid them by applying lots of tape to our breadboard but this only worked temporarily. Therefore, please do solder things to make them reliable. Porting over the Arduino software to INGA has been quite simple. To support the board, I had to modify the board specific config of Arduino. Next up, I have merged several sensor driver libraries into the repository, to support the gyroscope, the accelerometer and the air pressure sensor of INGA. Supporting the Atmel AT86RF231 IEEE 802.15.4 radio was reasonably easy since we could use the existing Contiki driver for the radio. The code can be found in the ArduINGo GIT repository. I have used the same abstractions for pins, etc. that Arduino uses. 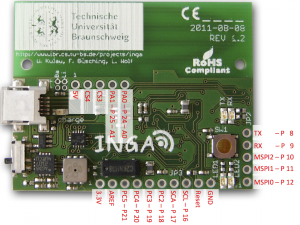 Please use the INGA schematics with the INGA specific header file in ArduINGo to figure out which pin number goes to which hardware port on the actual circuit board. MSPI[0-2] are used for the MSPI Bus connecting the accelerometer, the flash and and the SD card. If you want to use one of these components, do not interfere with those pins. SCA / SCL is for I2C and connects the gyroscope and the air pressure sensor. If you want to use any of those, do not tamper with those pins. RX / TX are the RS232 lines that are connected to the FTDI USB/serial converter chip. Since INGA is flashed over serial, better do not do anything with those pins. Pins 18 – 21 are used for JTAG programming. You can use them, but as far as I know, you will have to disable JTAG beforehand. The last element was fixed since we had the car already. I will outline the remaining three elements in the following sections. How to control the car using INGA? In our experiments we have found that holding INGA with a steady hand is difficult. Therefore, we have implemented a smoothing approach called the Expontentially Weighted Moving Average (EWMA) over both axis. An alpha of 0.75 has proven to provide a good compromise between smooth control and delay. 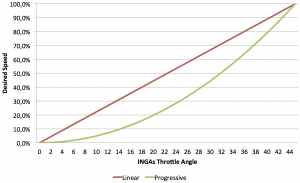 Furthermore, we have limited the active angle of both axis to +-45 degrees for steering and 0 – 45 degrees for the throttle. The primary motivation to do this is that calculating the holding angle proves to be quite unreliable the closer you get to 90 degrees. Furthermore, we have found that missing feedback to the driver will make the driver go over the maximum angle that has any effect. To avoid that the driver reaches 90 degrees too often, we have limited the angle to 45. To allow wireless control of the car, the steering commands have to transmitted over the air. 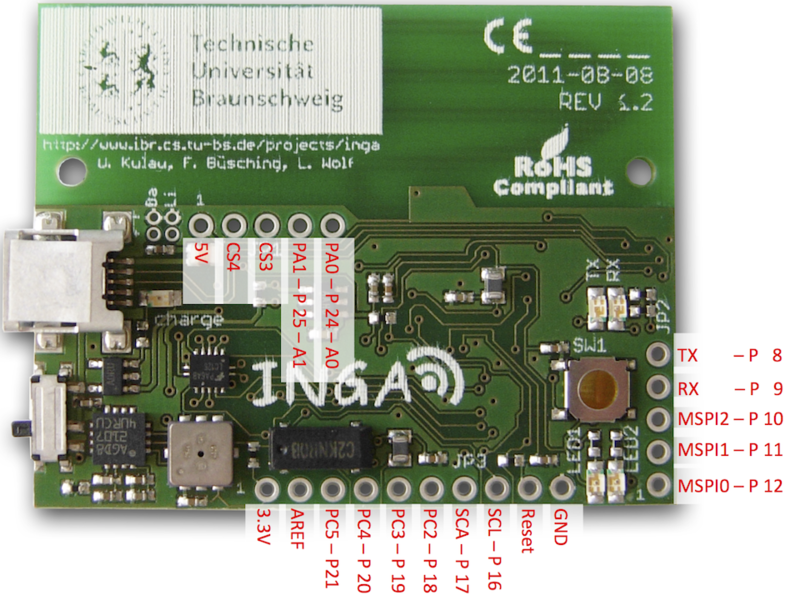 INGA has a built-in IEEE 802.15.4 transceiver which is connected to the microcontroller via SPI. We have adapted the existing driver from Contiki OS and ported it into the Arduino environment. With this driver, packets can be transmitted on the MAC level. Since the radio hardware does media access (CSMA/CA), acknowledgements and retransmissions for us, a separate MAC implementation is not necessary. On top of the driver, we have created a very simple abstraction with which you can “stream” values into a packet and send it of to other nodes. It does allow unicast- and broadcast transmissions and involves no further magic. That said, it does not route and multi-hop communication will not work at all. However, for many applications this level of abstraction should be good enough. We have normalized the steering commands to values between 0 and 10000. For the steering, 0 means “100% left”, 5000 means “straight foward” and 10000 means “100% right”. For the throttle, the same concept applies: 0 means “100% backward”, 5000 means “no power” and 10000 means “100% forward”. We sample the accelerometer with approximately 100 Hz and send of the two normalized values (16 bit each) in a unicast radio frame towards the receiver. To avoid interference by other active IEEE 802.15.4 nodes, we have a 16 bit magic number in front of each packet. The receiver constantly listens for packets. 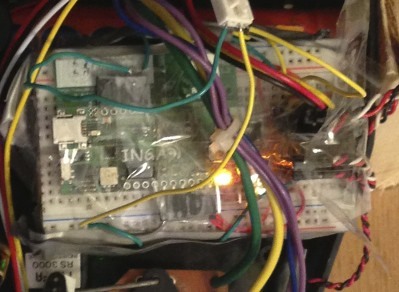 If a packet with the magic number arrives, the contained data is fetched and fed into the servo controller to make the steering commands happen. The update frequency is dictated by the sender. We have implemented a delay of 10 ms between two samples, so that the packet frequency should be somewhere below 100 Hz. Now that we have the normalized steering commands on the car, we have to convert them into something to make the car move and change direction. 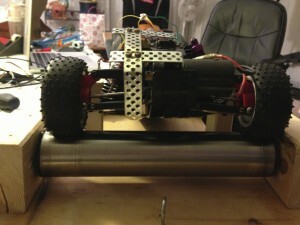 On the particular car that we have, the steering is controlled by a servo. 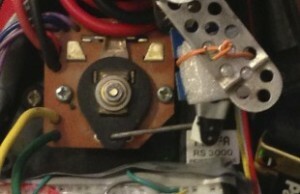 Servos (in general?) have a 3-pin connector with Vcc, GND and PWM whereas the last pin contains a pulse-width modulated signal that tells the servo into which direction to move. Arduino contains abstraction for Servo control that only need the pin to which the servo is connected and the angle to which the servo has to turn. We have calibrated the zero position of the servo and mapped the steering commands coming from the sender linearly onto the steering servo. The wiring is quite simple: we have connected the servo to Vcc and GND coming from the cars battery and connected PWM and GND to the appropriate pins of INGA. 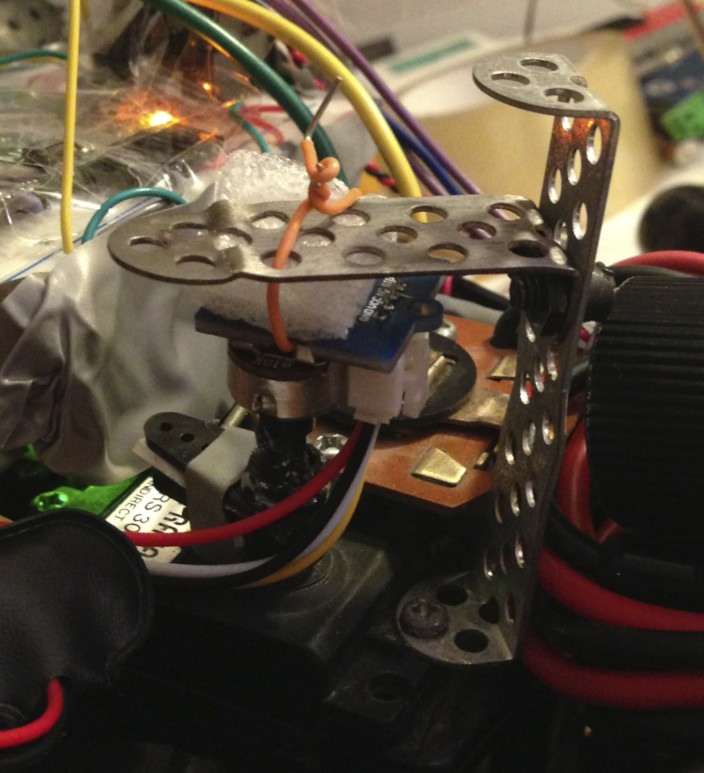 This simple setup allows to control the servo from software. For the mechanical speed controller, things are not so simple. This controller consists of a standard servo and a resistor that is controlled by the servo. This means, that movement of the servo is converted into different resistance values which in turn convert to different turning speeds of the motor. Furthermore, the MSC allows the motor (and car) to go forwards and backwards while the direction is also controlled by the servo. Unfortunately, controlling the motor with our MSC is not stepless and far from linear. 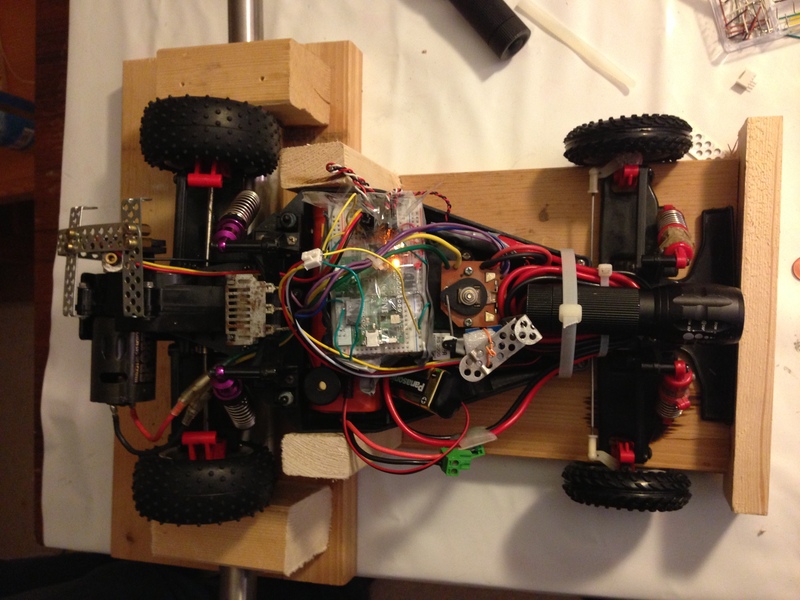 While this seems to be quite normal for RC cars, it is not intuitive for the user and we wanted to overcome this. Furthermore, the actual turning speed of the motor varies with the offered load – in fact, the servo seems to control the current of the motor. With a human in the loop this may be acceptable, but we wanted to improve. The next logical steps to allow a finer-grained control of the motor is to implement a closed-loop controller for the RPM of the motor. This however requires to measure the RPMs of the motor. To measure the RPM of the motor, we have thought about different concepts. Since we could not order any parts, we had to modify components that we had at hand. It turns out, that the Seeedstudio Flowmeter is based on a magnet and a hall sensor. We have taken the sensor apart and extract both – the magnet and the hall sensor. We have glued the magnet onto the shaft of the motor and mounted the sensor on the oposite side of the motor. This allows the magnet to turn freely inside the sensor with the sensor picking up 3 ticks for round of the motor. 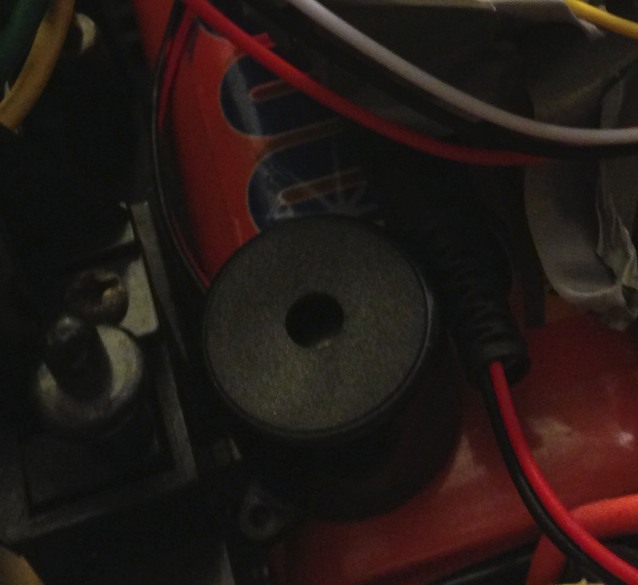 The sensor is connected to Vcc and GND of the car and the a digital input pin and GND of INGA. We have configured the input pin to be an interrupt and count all incoming ticks in 100 ms. We divide the number of ticks by 3 and divide by the time constant to calculate the number of rounds per minute (RPM) that the motor is currently producing. This allows us to implemented a closed-loop controller that adapts the motor RPM to the desired RPM of the user. However, the hall sensor only provides information about the RPM but not about the direction the motor is currently turning. Since the inertia is small, the motor may change turning directions quickly and figuring the direction out in software is problematic. Therefore, we need another sensor for this purpose. 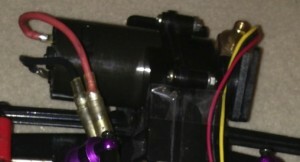 To find out the direction into which the motor is turning at the moment, we would have to have another sensor connected to the shaft of the motor. Unfortunately, we did not have the necessary parts and so we came up with an alternative idea: We assume that the mechanical movement of the servo is slow enough for the motor to change turning direction in time. Therefore, finding out the position of the servo is good enough to figure out the direction of the motor. We have used a potentiometer and glued it onto the servo controlling the mechanical speed controller. We have connected Vcc and GND to INGAs power supply and have connected signal to one of the analog inputs of INGA. This allows us to sample the voltage coming from the potentiometer. Since we only need to know the direction into which the motor is currently turning, we only have to compare the current value with the zero value. We calibrate the zero position during each startup of our program on the car to compensate for changing voltages, etc. On retrospective, finding out the motor direction may also be possible in pure software. Our first approach was to detect zero-crossings on actual motor RPMs and then change a direction status variable. However, this heuristic turned out to be ineffective and error prone and tended to confuse our controller (see next section). However, looking at a sufficiently large moving average of the servo position compared to the current value may enable us to reliably detect the current turning direction. Up until now, we did not explore this path. We have further found, that the car is not breaking hard enough when the driver reduces power. Therefore, we have implemented a variable Kp. Under breaking (current RPM > target RPM) we change Kp to 5 * Kp. As said in the previos section, we needed a test setup that allows to test the controller settings in the lab. Furthermore, we needed more or less reproducible conditions to see if changes did what they were intended to do. We have used a standard kitchen rolling pin (that thing that you use to make your pizza dough flat) mounted between two wooden blocks. We have furthermore mounted the car in a way, that does not allow the car to move. As we all know, vehicles driving backwards are extremely dangerous. 😉 This is why trucks have the beep noise when reversing. To imitate this behavior, we have integrated a beeper into our car. We have connected a transistor to a digital output pin of our car and use it to control the beeper. Based on video footage found on youtube, we have configured the beeper to be 500ms on and 400ms off. This seems to be a good approximation of the beeper found in commercial trucks. We enable the beeper once the input to the car indicates to go backwards. With the old (analog?) remote control it happened from time to time, that the car drove out of range or that the transmitter or receiver would stop working. 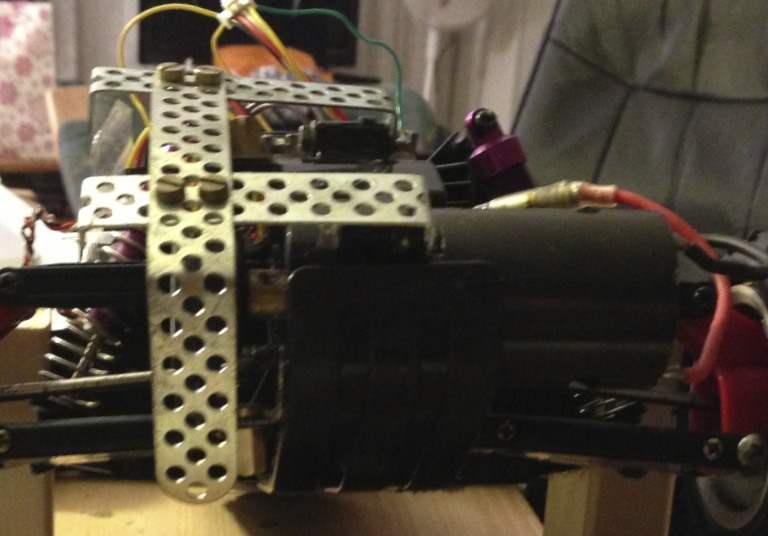 This is a bad thing, since the servos will remain in their position until they get further instructions. In other words: forever. This is especially problematic, because when the cars speeds away from you and you loose contact, it will continue to do so until the batteries are drained or until it finds an obstacle to crash into. Both not very desirable. Therefore, we have implemented a timeout mechanism into the car. When no valid steering packets have been received within 100 ms, the steering will be put into the initial “straight forward” position. The desired RPM for the PID controller is set to 0, so that the car automatically breaks until it stands still. We have tested the behavior multiple times by simply switching of the sender and it turned out to be extremely helpful. It also acts as our emergency shutdown. When something goes wrong, we switch off the car and it comes to a full stop as quickly as possible. The result of our effort is actually quite impressive. The car drives like hell (just like before) but has a whole different steering concept and the throttle is much easier to controller. Unfortunately, we found a premature end because a port of the front suspension broke and we did not have replacement parts. You can see a video in youtube. Unfortunately, the commentary is in german – but the essential things are visible without understanding a word. After we have mechanically repaired the car, we still have a number of steps to go. Most importantly, we will replace the mechanical speed controller for an electronic version. 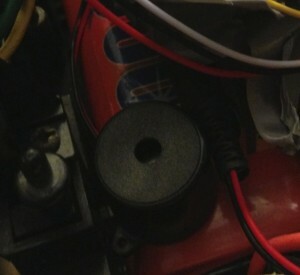 The interface is the same, but it will make controlling the motor much easier. Furthermore we will replace our breadboard with a hole matrix board with proper connectors for INGA and the other external components. Alternatively, we may produce an adapter board which enables us to use INGA with standard Arduino shields. Also, the parameters for the PID controller will need to be adapted to the new speed controller and to enable even faster breaking and acceleration. 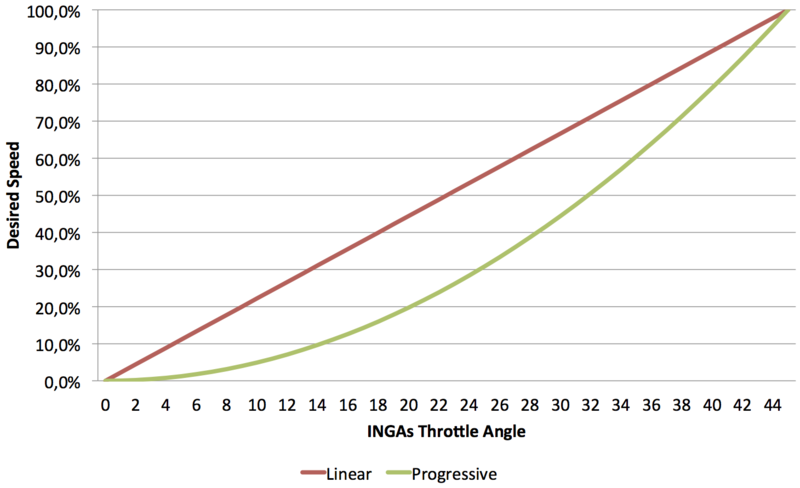 Finally, we plan to implement driving aids based on INGAs gyroscope and accelerometer. 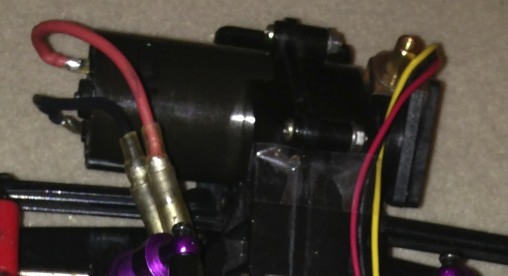 With these two sensors, we should be able to limit the motor power of the desired and the achieved turning angle mismatch and do other fun things.